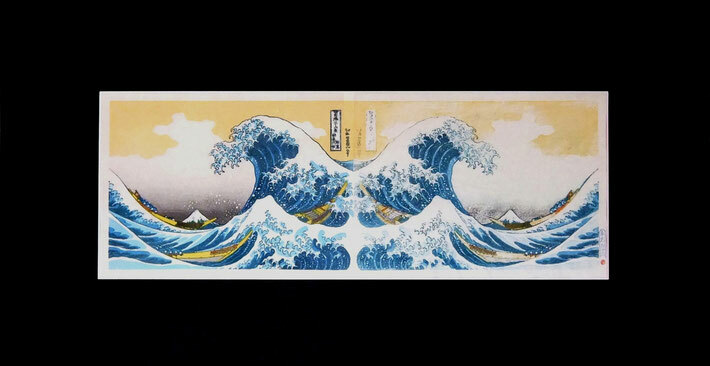 The Great Wave both sides off Kanagawa, front and back by Kou Taira from arranged Hokusai "Hekusai series"
Mirror print "Kagamisuri" doesn't print using reversed woodblock. 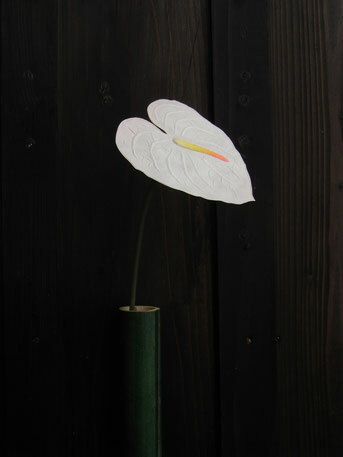 It is printed using washi paper was laminated to one sheet from two sheets. 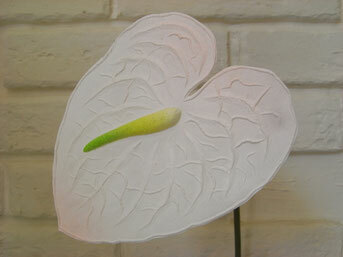 And it is completed by peeling off laminated washi paper again. So, you'll see that depth of the left and right printings is the difference. Control of the printing is very difficult. 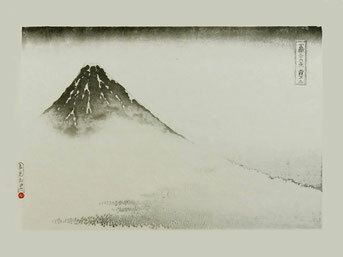 Misty Fuji by Kou Taira from arranged Hokusai "Hekusai series"
Front printing"Shomensuri" originally is a technique of ukiyo-e. It was rubbed(printed) by baren without attaching pigments, in order to give gloss to black-color. 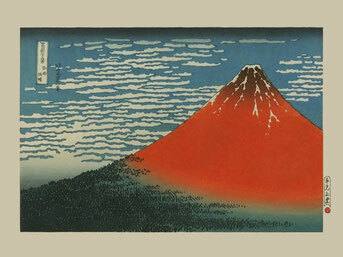 "Kasumi Fuji"(left picture) is printed using the same woodcut block as the "Red Fuji" of Hokusai. Today, the front printing"Shomensuri" is printed by impregnated pigment to front of washi-paper from the block. It is printed like rubbing. So, you'll see that an image is reversed. I represented the feeling misty using the blur of pigment . Blank-impression printing / Enbossing "Karasuri" "Kiwasuri"
Blank-impression printing"Karasuri" is seen in the representation of the snow in ukiyo-e. It was rubbed(printed) by baren without attaching pigments. Today,It's embossed to washi-paper by using an etching press, Baren, a spoon and a spatula. It's is used thick washi-paper. 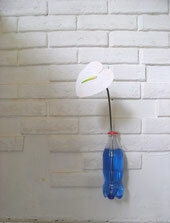 I produced a concept art using the Anthurium(woodcut print), a plastic bottle, and plastic wire etc.